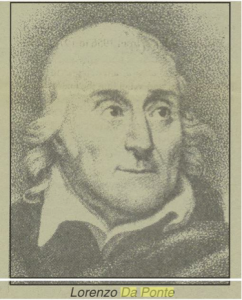 Lorenzo Da Ponte from the Columbia Record, 10 May 1991, article announcing the exhibition “Lorenzo Da Ponte: A Vision of Italy from Columbia College” at Low Library. On October 15 and 17, the Cagliari Opera House will present the first modern rendering of the opera L’Ape Musicale (The Musical Bee) in the Rotunda of Columbia University’s Low Memorial Library, at 7:30pm. The performance is part of a symposium, Lorenzo Da Ponte and the Birth of Italian Opera in New York. Both events are free, ticketed and open to the public. L’Ape Musicale is Lorenzo Da Ponte’s final libretto and the first Italian opera conceived and staged in the United States. Da Ponte, author of Mozart’s best known librettos (The Marriage of Figaro (1786), Don Giovanni (1787) and Cosi fan tutte (1790)), was the first Professor of Italian at Columbia. This entry was posted in Columbia University Archives and tagged L'Ape Musicale, Lorenzo Da Ponte, The Musical Bee on October 10, 2018 by Columbia Rare Book & Manuscript Library.